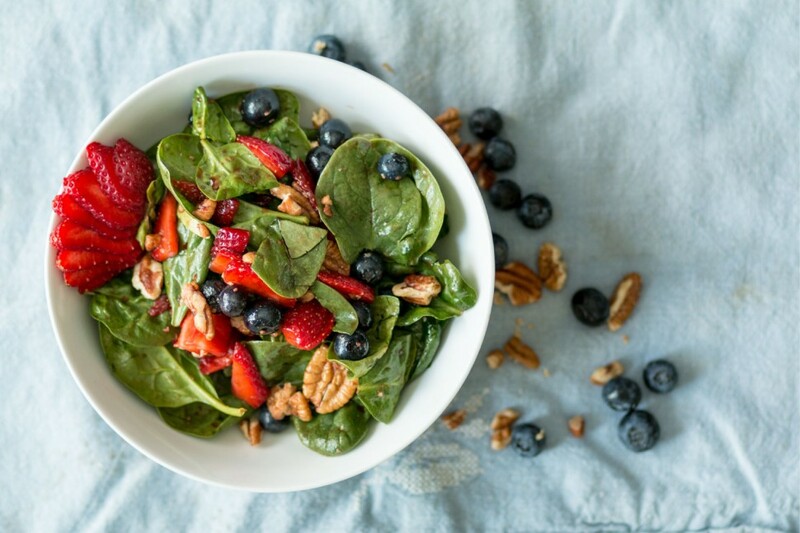 Kick off the summer with a Strawberry Spinach Salad! The berries give this salad a sweet taste so no need for sugary dressings. I like to mix up my balsamic vinegar with the flavored ones - orange or raspberry are delicious. Combine all dry ingredients.Toss together the spinach, strawberry, blueberry and pecan and get a nice and even distribution of ingredients. Drizzle wet ingredients and toss. Stay on the side of caution here, less is better. It is easy to overdo it with the olive oil here, and you can always add more. A little goes a long way with both of these ingredients! Sprinkle a few drops of each and toss a few times to check how much it coated the ingredients. Add a few more drops and repeat if necessary! Serve this paleo spinach salad with roasted chicken, grilled steak or just straight up and by itself!